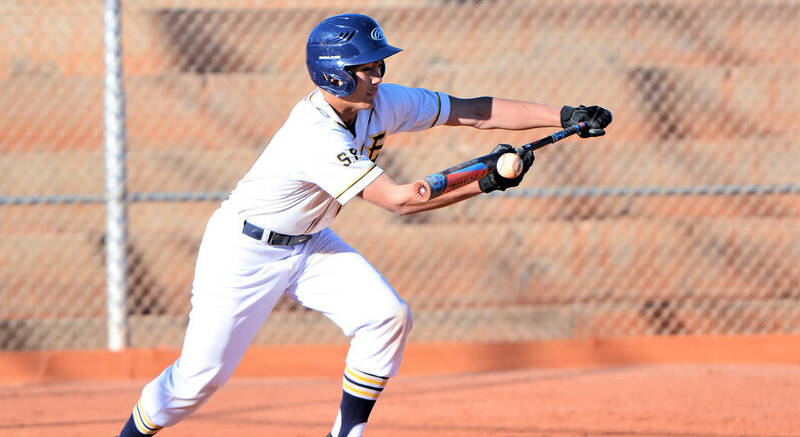 Boulder City High School’s baseball team is playing at a high level to start the season, returning home from Utah with a 4-0 record after a stellar performance in the Southern Utah Spring Kick Off Tournament held March 15-16. (Robert Vendettoli/Boulder City Review) Laying down a successful bunt, Boulder City High School sophomore Deavin Lopez reached first base safely in the Eagles' 10-0 victory over Western on March 13, 2019. Allowing only two runs the entire tournament, the Eagles cruised past larger competition, defeating Hunter 10-0, Highland 4-0, Thunder Ridge 18-0 and Wasatch 14-2. Getting up for big games and playing lights out, the Eagles are gelling ahead of league play, with hopes of capturing their fourth 3A Sunrise League title in five seasons. Clicking on all cylinders on the mound, seniors Brendan Thorpe and Brian Miller each picked up victories, along with sophomore Joey Giunta and Troy Connell. Against Hunter, Thorpe threw five innings where he struck out nine batters. Giunta threw three innings against Thunder Ridge, striking out three batters. Getting it done at the plate, sophomore Blaze Trumble batted 2 for 3 with three runs batted in and a double against Thunder Ridge, while batting 2 for 3 with two RBIs against Wasatch. Dunagan batted 1 for 2 with a two-run triple against Wasatch. Dunagan (2 for 2), Trumble (2 for 2), Giunta (2 for 4) and Connell (1 for 3) all drove in two runs against Hunter. Undefeated against Nevada 3A opponents this season, the Eagles defeated Western 10-0 on March 13, Del Sol 10-0 on Monday, March 18, and Mojave 3-0 on Tuesday, March 19. Connell picked up the victory against Western, while Giunta defeated Mojave. Sophomore Scott Bahde picked up the win over Del Sol, throwing five innings where he struck out 10 batters. The Eagles will host SLAM Academy on Friday, March 22, and Democracy Prep on Monday, March 25, before traveling to face 4A Silverado on Wednesday, March 27.